Thank you to everyone who has read Flynn's Log 1:Rescue Island. Your fan mail and tweets mean so much to me and are pushing me to finish Flynn's Log 2. I'm working on the illustrations and editing now, which means I should be publishing next week! Flynn's Log 2 is that big! You think you know Flynn, Zana and Thorn. Think again. In Flynn’s Log 2, he meets new friends and goes to new places! I've been asked about gaming with you guys on Minecraft servers. I would LOVE to, but then the release of Flynn's Log 2 will be delayed. So, I'll work while you play. 🙂 I would love to help you meet other friendly players who want to play on servers together. For now, tweet me @GoStoneMarshall with the hashtag #StoneMarshallClub, and I'll retweet. Anyone who wants to join, watch my retweets and follow the tag #StoneMarshallClub. We'll see how this works together. I'm giving away 20 paperback copies of Flynn's Log 1! The contest is run by Goodreads.com and ends in 3 days! If you haven't signed up, do it now! I really want you guys to win my books! If you don't win a paperback of Flynn's Log 1, they are available in several places. I'll keep an updated list on my website here. Share Flynn's Log 1 with your friends. You can give them the eBook free, for now. I'm not sure how long I can give it away. To be safe, tell them to get it soon. Forward this email or share this link. P.S. If you LOVED Flynn's Log 1, please write an honest review. The more reviews I get, the more books I'll be able to write, so take a moment and post lots of stars. It can be as simple as “I loved it!” Review here. P.P.S. 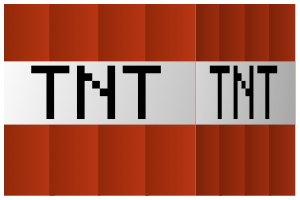 Guess why a picture of TNT is attached. Hit reply and tell me what you think! I love your books and am so glad to be talking to you via email. I would love to know when flynns log 4 will be out. The plot line is sooooooo good i wish i could read your books forever. Flynn’s Log 4 is coming along and every day something amazing happens. It’s like the story is cool in my mind, but I write something that I didn’t expect. Elle is doing things now that I had no idea she was going to do. It’s kind of amazing how the story unfolds. I am planning to have Flynn’s Log 4 out before the end of November, hopefully sooner!